What do the Washington, D.C., offices of Rep. Don Young, Sen. Lisa Murkowski and Sen. Dan Sullivan say about the occupants? Take a tour and see. Many people spend more time at work than at home, and their offices begin to reflect the person who toils there day after day. 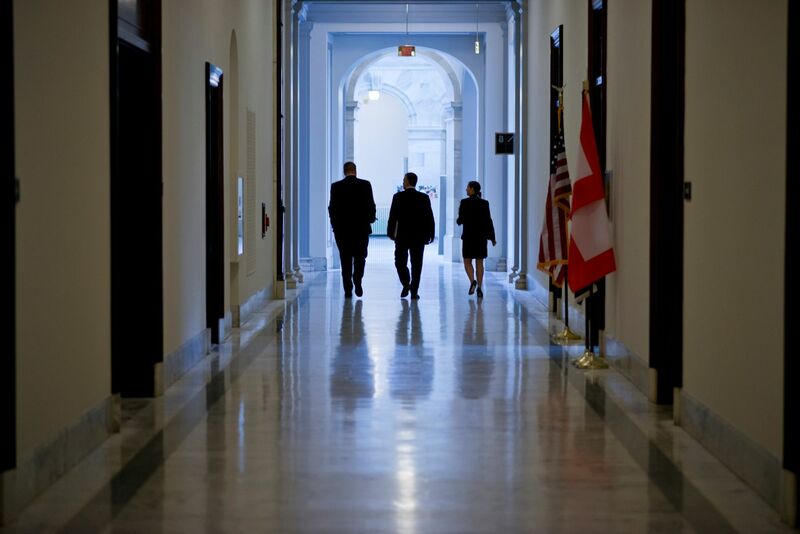 For the three members of Alaska's congressional delegation, their Washington, D.C., offices are no different. All three offices contain mementos of home — state maps, photographs and artwork. And each reflects a personal side of the politician. 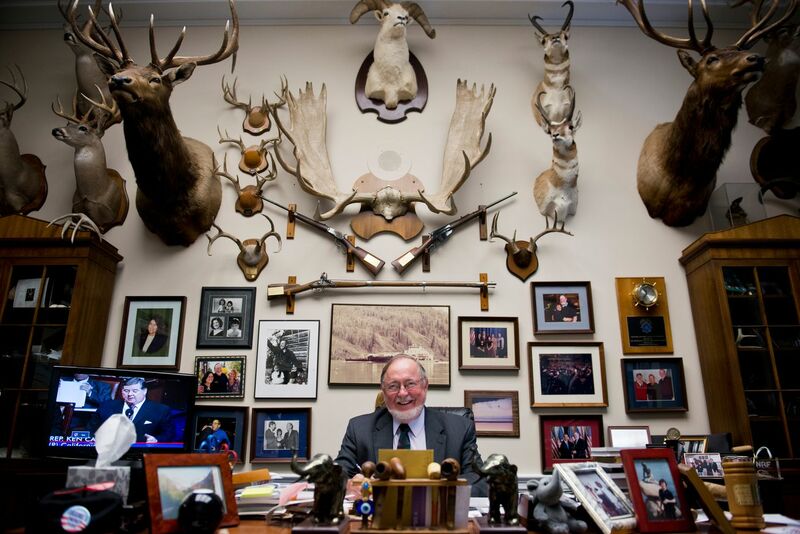 Rep. Don Young's office is renowned for its walls — covered with 55 animal trophies. Sen. Lisa Murkowski almost never sits down — and has a standing desk in her office to keep things moving. 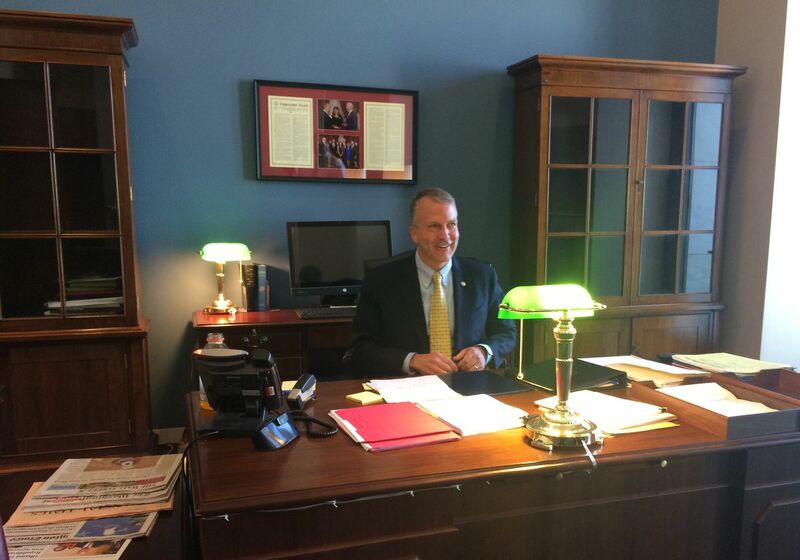 Sen. Dan Sullivan, half a year into his first term, has personal military memorabilia and the bare-shelved personal office of a guy who just moved in. 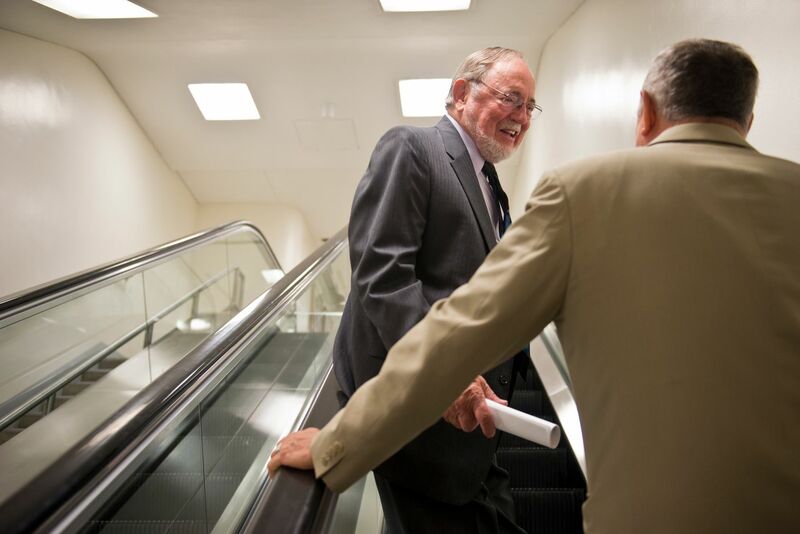 Alaska's congressman of 42 years adopts a gruff tone when reporters hang around his office, but others who wander by the Rayburn House Office Building on Capitol Hill are greeted with jovial handshakes, back slaps and bear hugs. And there are many: Alaskans visiting D.C. aren't hard to come by, and state officials and residents can be found there most days when Congress is in session. Young's office also catches the eyes of folks who aren't all that familiar with the 49th state. Young's office staff sees it most days: Someone strolls past the door, makes it a few steps past and then suddenly hits reverse. They lean back, turn around or back up a few steps to do a double-take after catching a glimpse of the grizzly bear skin hanging on the office wall. Word around the office is that some passers-by mistake it for a polar bear. Young isn't the most senior member of Congress, but he's close enough to have the largest office in the House of Representatives — a bit of bonus square footage afforded by an architectural quirk. The walls are covered with dozens of animals, including moose, a Dall sheep and a zebra. 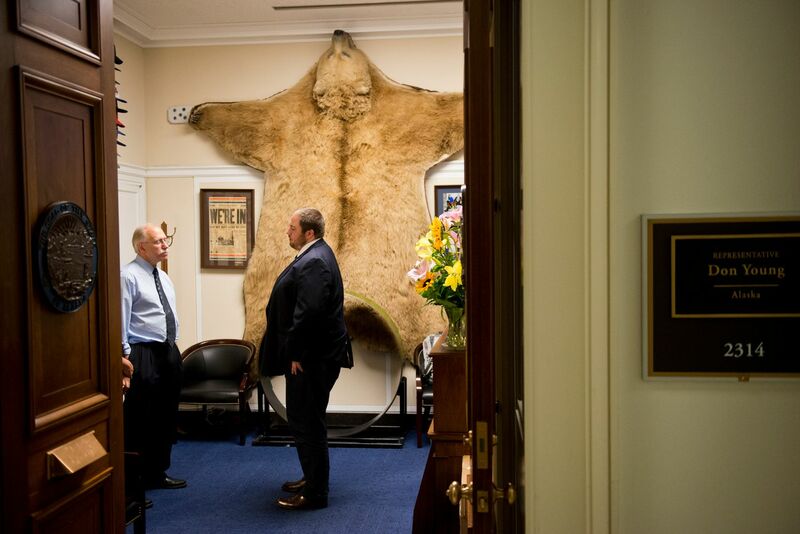 Nearly all of them are Young's personal hunting trophies, save for carved walrus tusks, artwork on loan from the Arctic Slope Regional Corp., and a wolf pelt that hangs above the couch in his personal office. But animals aren't the only wall decorations. Young also has quite a few mementos from his 42 years in the House. There's a wall of hats, an award here and there, and an invitation from former West Virginia Rep. Nick Rahall, a Democrat, for the State of the Union speech in 2011. That year, lawmakers decided to sit with "dates" from across the aisle. (Rahall, in office nearly as long as Young, lost his seat in 2014.) The note reads: "Don, if I get this 'politically incorrect' please forgive me as it's my first time … Would you be my date for the State of the Union Tues. night!?!?! – Nick"
On June 25, after a private meeting with Fairbanks North Star Borough Mayor Luke Hopkins, Young sat behind his desk to preside over a gaggle of interns sent over by Sen. Murkowski. 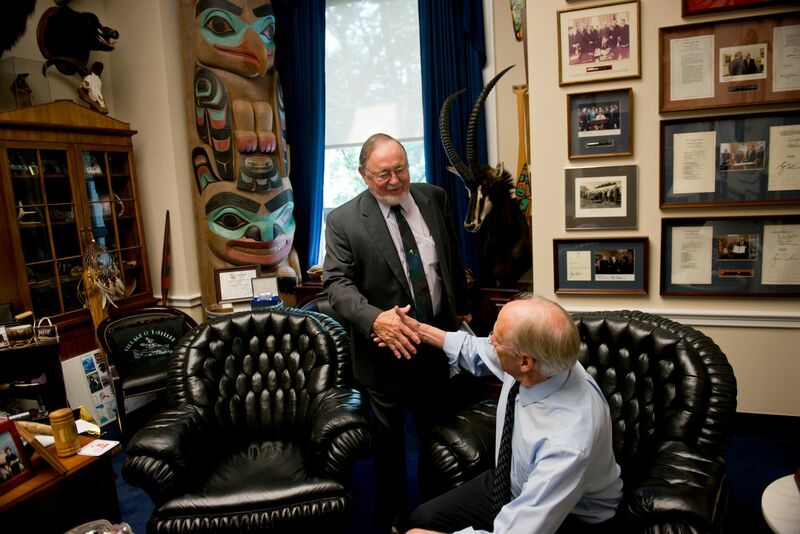 In the corner of Young's office rests a massive totem pole that once belonged to the late Sen. Ted Stevens. 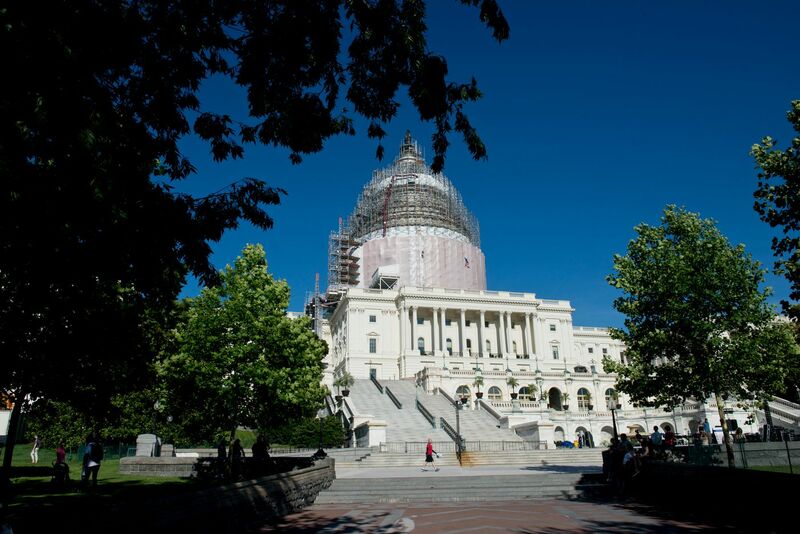 In a chiding tone, he reminded the interns the difference between the House and Senate, as he sees it: "There's only one House member; there's two Senators." "I like being the only congressman," he told the Alaskans who had just graduated from high school before spending a month in Washington, D.C. "Primarily because if I do anything and it's right, I get 'yayy!' and if I do anything wrong, I get 'booo!' " Young said, telling them that unlike states with multiple representatives, there's no he-said, she-said blame to go around. "So that's sort of a unique position being in Alaska. … That gives you a great deal of freedom." The hardest part of the job? The flying, according to Young. "It's 11 hours to Anchorage, and then from Anchorage I've got to fly wherever I'm going to go," he said. Doing that "every two weeks is the hardest thing on me." Until 1975, members were only afforded 12 trips a year, and that led to a more collegial atmosphere in Congress, he said. "So everybody brought their wives back down, their kids down. My kids went to school, we knew one another. Colleagues, D's and R's worked and fought together. It made a much more congenial group of people, because we understood one another." Now most members head out Thursday night and aren't back until Tuesday. "And so no one really knows one another. And it's hard to do legislation if you don't understand where that person's coming from, what his district is, what his personal thoughts are. Forget the D's and R's. And consequently we've got a stalemate right now, and it's not good for the country." 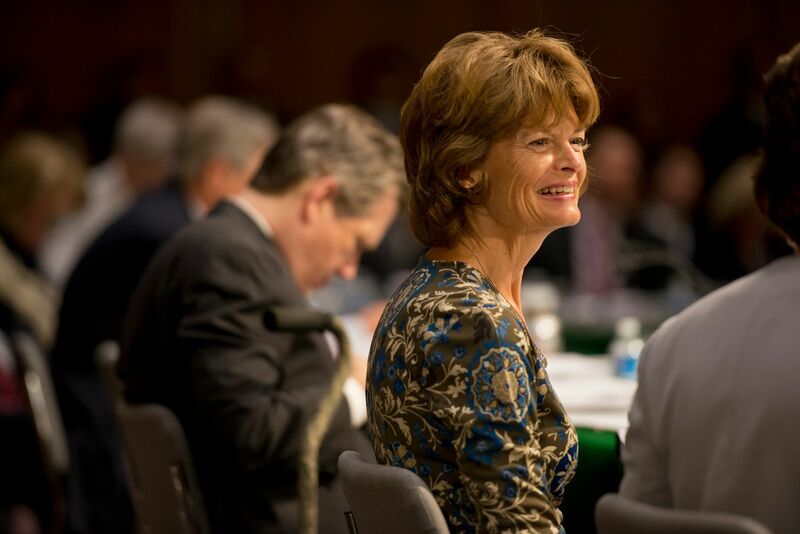 Alaska Sen. Lisa Murkowski is doesn't seem to spend much time alone when she's in Washington, D.C. In the summer, she runs an unusual intern program — bringing recent Alaska high school graduates in for a month-long program. Each day, two interns shadow her. 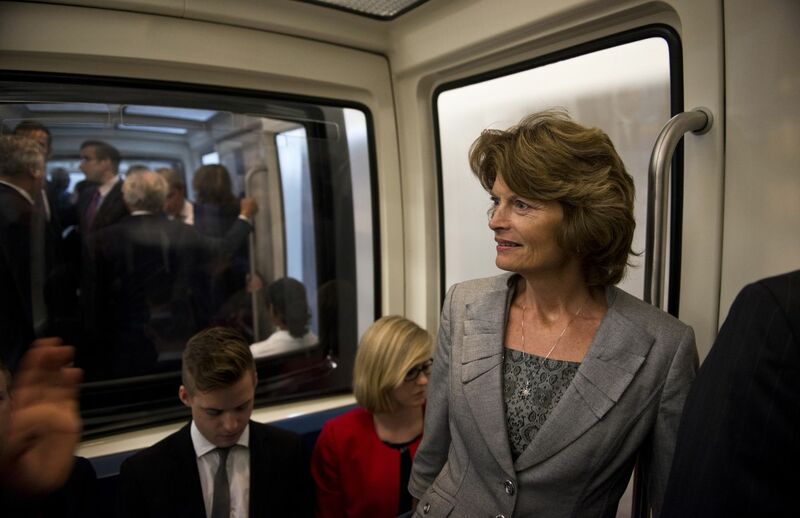 When she was in college, Murkowski interned for the legendary Sen. Ted Stevens. And when Murkowski heads over to vote in the Senate chamber, she rarely moves without interruption. Usually, a few reporters angle for her attention to gather a quote from the chair of the Senate Energy and Natural Resources Committee or an update on high-profile legislation. Murkowski's personal office is on the seventh floor of the Hart Senate Office Building, a modern, glass-and-marble-style building completed in 1983. The walls of 709 Hart are lined with Alaska art and photos, and a back hallway holds a map marking wherever the senator has been in the state on her trips home. In her personal office within, Murkowski sheds her heels quickly, opting to go barefoot on the room's ivory-colored carpet. A small desk is set up in the corner, but it goes mostly unused. (A staffer recalls that in his first week, someone suggested he trade his broken chair for the senator's, given that she rarely uses it.) The senator who never sits works at a standing desk. 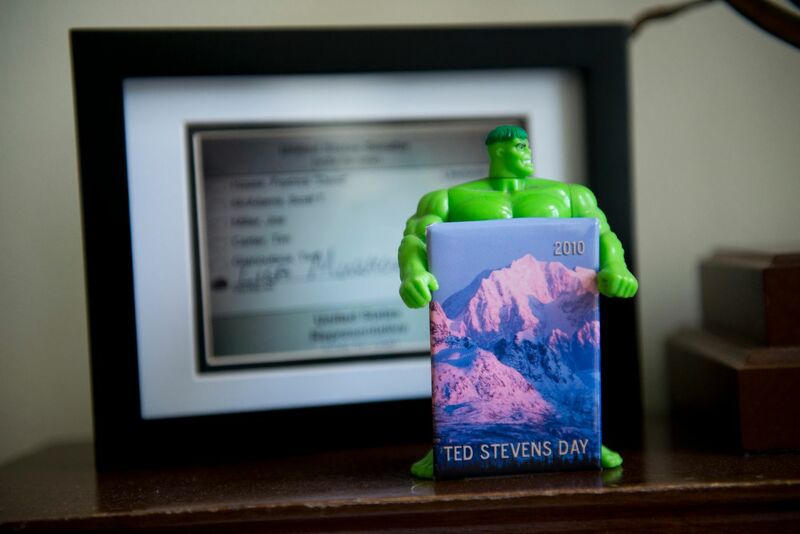 It holds a few photos and campaign memorabilia, including a photo of a write-in ballot from her last election and a Hulk figurine that holds a "Ted Stevens Day" pin, a reference to the late senator's famous Incredible Hulk tie. Murkowski also has her own Alaskan-carved totem, and a 3-D icebreaker puzzle displayed on a side table. 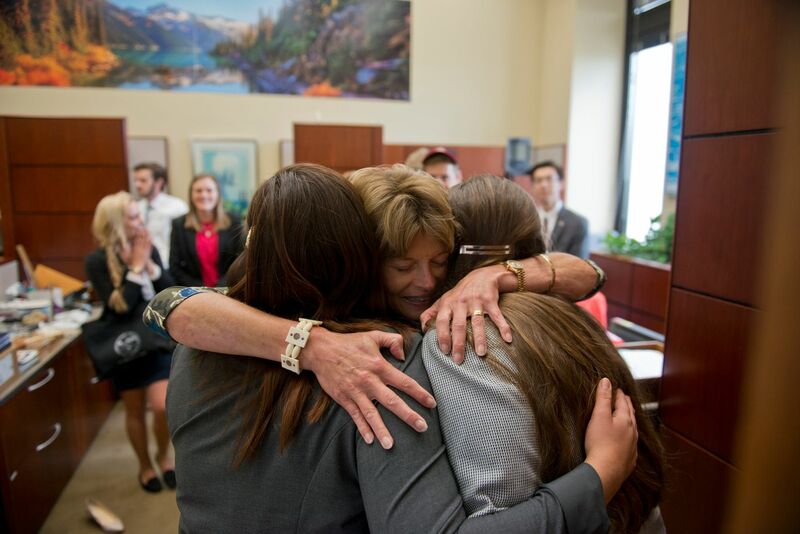 Late one afternoon in June, Murkowski gathers her interns for an office tradition: the gift closet. It's filled with odds and ends, knickknacks, snacks and memorabilia from Alaska. 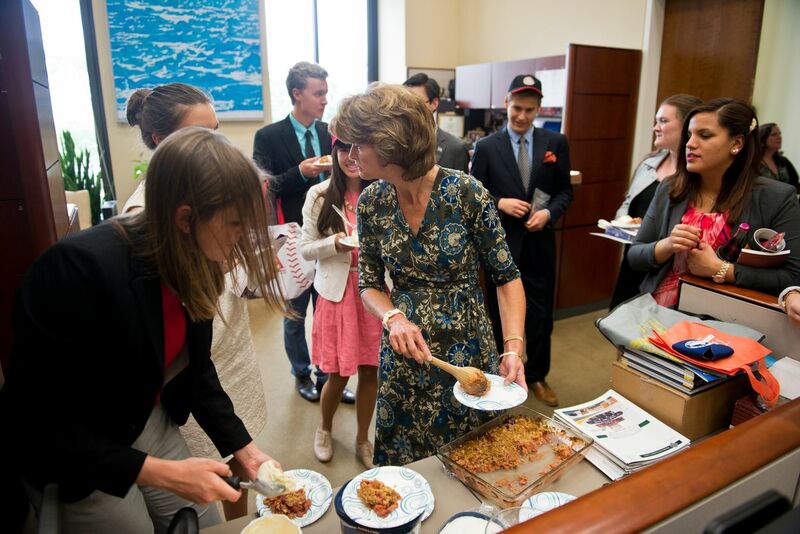 When their internships end, Murkowski gathers her teenage interns and parcels out presents. A few get tote bags and candies, two more take home boxes of golf balls. 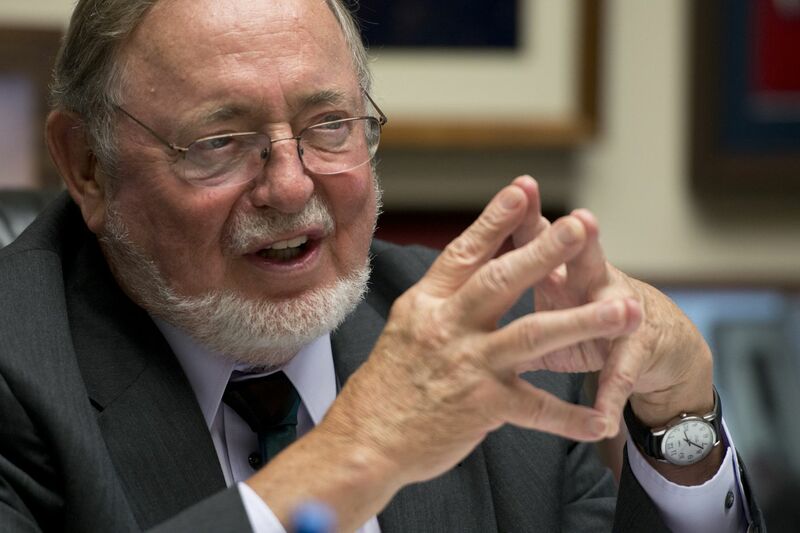 Nobody wants a copy of James Buckley's book, "Saving Congress from Itself," and it goes back in the closet. She quickly guesses that none of the young folks present has an actual CD player, and skips a gift package of CDs. "Go home and do good things the rest of the summer and do well in school. Stay focused and make your parents proud and your state proud, OK?" Murkowski tells the interns as she scuttles them out of her office. 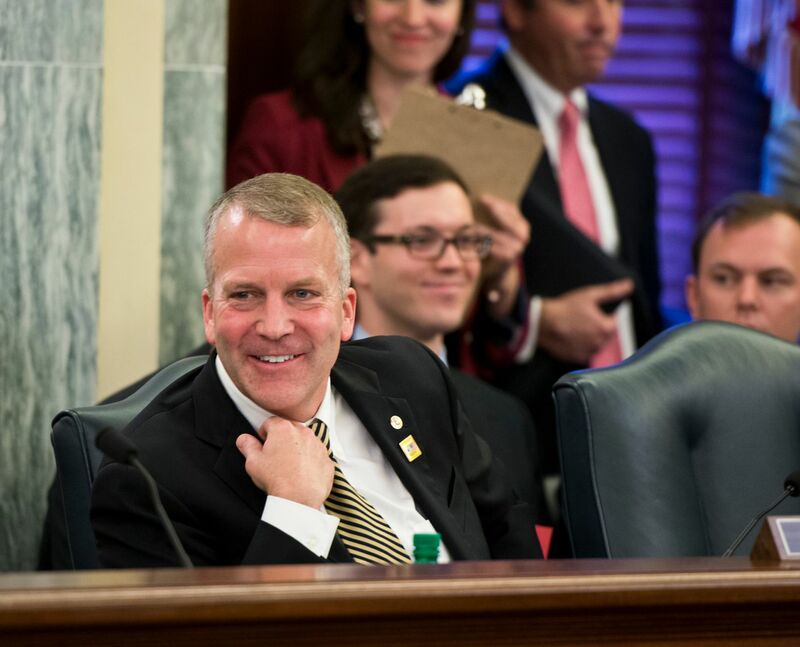 Sen. Dan Sullivan is ranked 100th among 100 senators, putting the "fresh" in freshman. 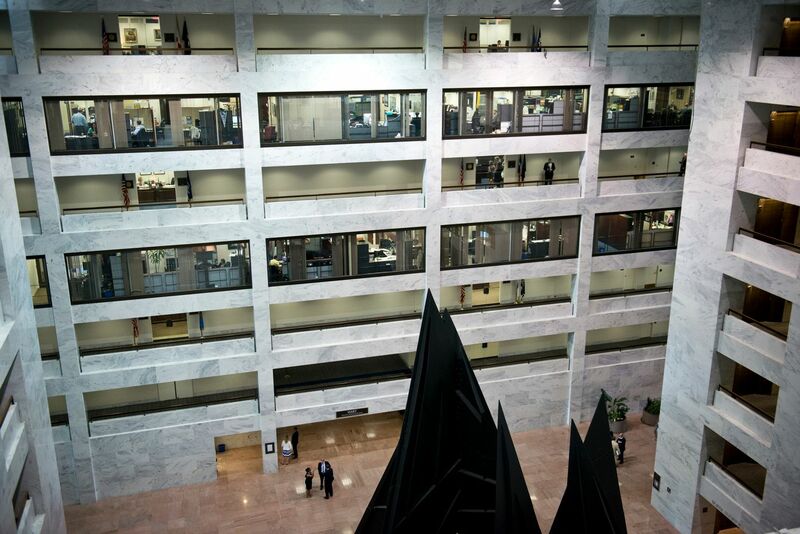 His early days in office included temporary digs in a basement hallway, but he has since been upgraded to the seventh floor of the Hart Senate Office building, just around the corner from Murkowski. Speaking to some Alaska visitors in his office on a recent July day, Sullivan recounted how he came to be last in line. Seniority for Senate newcomers first goes to those who were previously members of Congress, or governors. Those who didn't have former positions are ranked by the size of their state. Sullivan joked that he was disappointed to find that they meant "the size of your state in terms of population." "So I was ranked number 100." That meant Sullivan had no choice in his office, but he's still quite impressed with the results, he told his recent visitors. "So this is the office we've got. We had no choice. … So when I walked in, I'm like, damn, right?" he said, quickly showing off the balcony off his personal office, which overlooks the Veterans of Foreign Wars building on Capitol Hill. 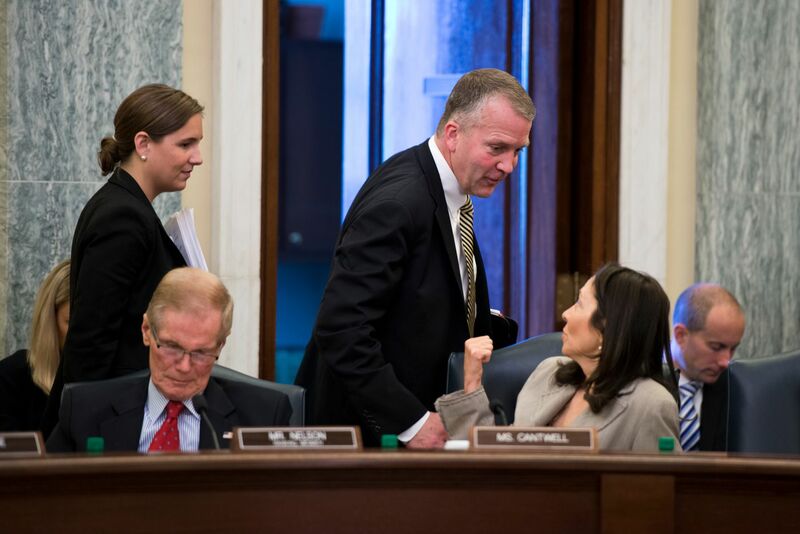 Sullivan, who is a lieutenant colonel in the U.S. Marine reserves, perks up at the sight of high-ranking military members in the Capitol halls and relishes his spot on the Armed Services Committee. But, he tells one visitor, "I'm not used to being called 'sir' by the commandant of the Marine Corps." Sullivan gets a lot of visits from Alaskans who are in military, often several a day, according to his staff. The outer office now has pictures hanging — new additions. And he has framed copies of the treasury warrant for the purchase of Alaska, and the act of Congress that made it the 49th state. In Sullivan's personal office, however, it's clear he's just moved in. Cupboards and bookshelves are nearly bare. A lone plant loiters on a corner table. The high-ceiling walls are bare, save for a framed photo of his swearing-in and a copy of the Congressional Record from that day in January, hanging above his desk. His desk is piled with papers, with the daily newspapers fanned out nearby, and a bottle of Gatorade next to the phone. He's considering painting the words of the Bill of Rights on the blue wall behind his desk, he said. And for a conspicuously empty spot on the wall, between the American and Alaskan flags, "I'm trying to get something like a big nice painting of Denali or something. That's the goal."